Even children sometimes need a space to get away and have some privacy. A space they can really call their own, and have some peace and quiet to read or play a game on their tablet. 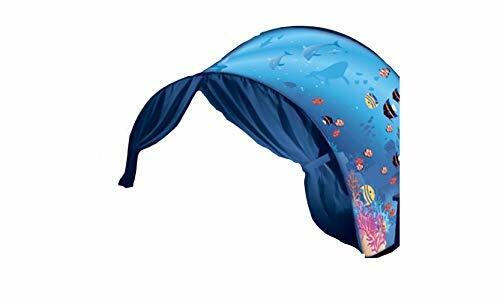 Dream tents are a simple solution to this problem, with quick pop-up and fasten features that even a child can handle by themselves; and it even has built-in privacy drapes (Source). With this inexpensive solution, any child can have a tiny world of their own, and get away from siblings for some quality me-time. The best part is, when a child gets to embrace the joys of being alone, parents can only relax with solitary activities. 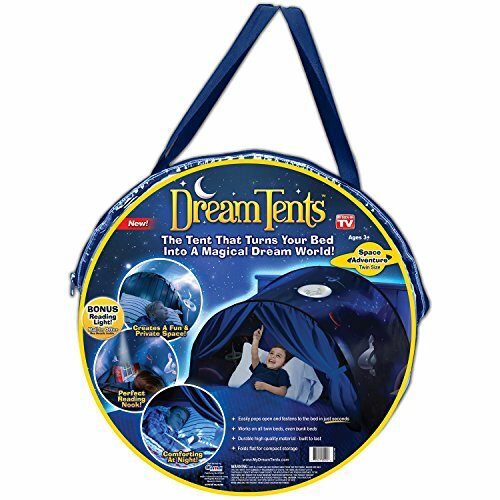 What is a Dream Tent? We researched buyer feedback on a couple eCommerce sites to figure out best buying practices. Right Style? Some buyers mentioned that they received the wrong style of tent, but it was too close to either a birthday or Christmas to return it for the proper item. Be sure to buy ahead of time to give yourself some wiggle room in case a return is necessary. Mattress Fit Issues: Heed the advice of many buyers, and “make sure the tent will fit the mattress” before buying one. Different variables like bed size, frame, and bunk beds can have an effect on how the cover fits and stays on. Mail-In Rebates? 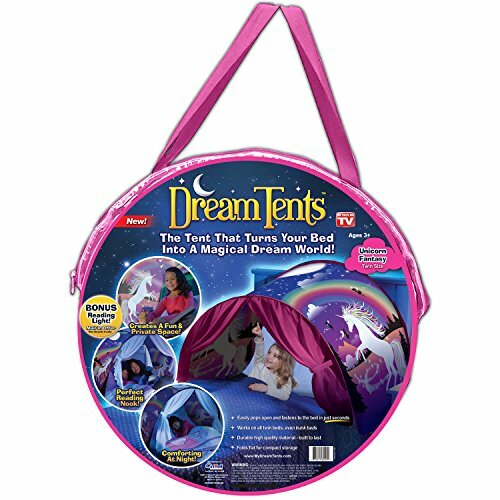 If you’re shopping for a dream tent, you’ve probably seen the advertisement that the cover comes with a free reading light with a mail-in rebate. Many buyers were frustrated because the advertisement makes it seem as if the light comes with the cover, when it’s actually something you need to send in a rebate form to receive. However, one buyer did go through the process of filling out the mail-in rebate, and said that their rebate was denied, and another buyer claimed that there was no rebate form in her packaging for the dream tent. 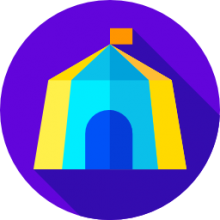 A “dream tent” is a small tent that covers the head of a child’s bed to give them a fun and private space to read or play games. These bed covers can help children feel more safe and secure if they normally have trouble sleeping in their own room, or in their own bed. Two curtains are attached to the sides that can be closed for privacy, or opened and secured off to the side. They’re so easy to install onto a bed, that kids can do it all by themselves. Simply slide a U-shaped plastic anchor under each side of the bed, and then attach both sides of the pop-up cover. When you’re done, it folds up easily into a disc shape and can slide into small spaces out of the way, such as under the bed. If your child is rough on their belongings, it’s no problem. These pop-up covers are very durable. They come in lots of “different themes” (Source), so there’s something that every child would love. Pop-up bed covers are very popular right now. These would make for a great Christmas or birthday gift, or simply a surprise! 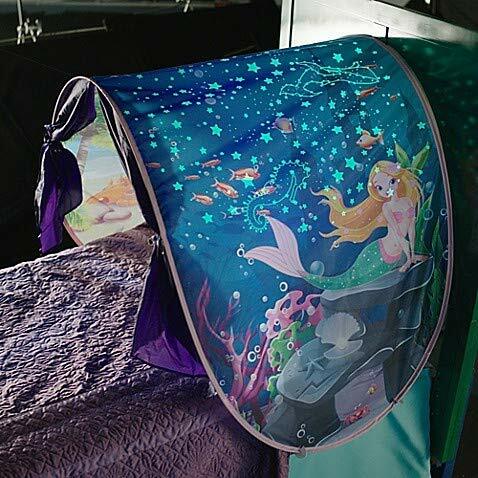 The company Dream Tents also makes a separate line of covers that are advertised to glow in the dark. At this point, it looks like they might be discontinued, as they’re very hard to find online and many say they are out of stock. Some reviewers also report that the glowing tents don’t actually glow as advertised, so this may be the reason the company is phasing them out. 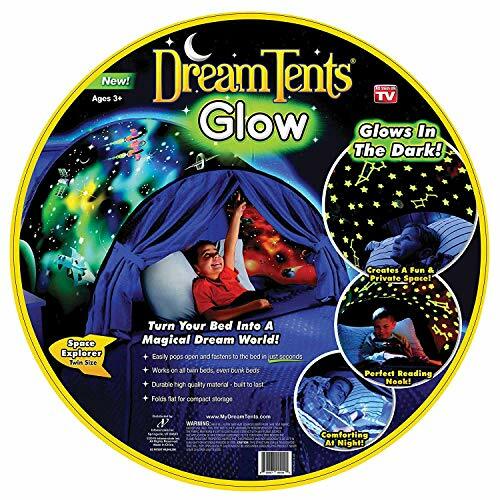 Most dream tent sellers advertise a free clip-on book light that kids can attach to their pop-up cover. However, it requires ordering the cover itself, filling out a rebate form and mailing it in, and then waiting for the light to arrive. Since the book reading light they advertise is just like any other book light, you could simply order one online at the same time you order the cover so that there’s no waiting around. – Target sells a great Energizer great “clip-on light”. – Walmart has a “flexible led book-light” that attaches with a clip. Target offers the popular “unicorn theme” online, and also sells them in store. Although Bed Bath and Beyond is out of stock online, you may have luck at your local store. Several websites claiming to be the official Dream Tents website also sell the covers online, but be cautious when ordering anything online from a website you’re not sure of. Some of the same unverified websites claiming to be the official website of the company are also advertising covers that will fit full-size beds. This seems to be a ploy to get people onto their site because all of the full-size products are constantly out of stock. It appears that dream tents are only available for twin style beds right now. Unlike the pop-up tents, it covers the entire mattress, giving even more privacy, and a cozy feeling. It does cover a much larger area than a standard dream tent and on a much larger mattress. Even adults can enjoy the cozy feeling of a bed cover with this option.